As being prominent manufacturer and exporter of the best quality containers, we provide finest quality of wire mesh pallet cages for easy and convenient handling and transporting of many products of different industries. Reinforced sheets of steel and metals are used for the fabrication of wire mesh pallet cages. Finest grade material of construction with cutting edge technology made robust products. 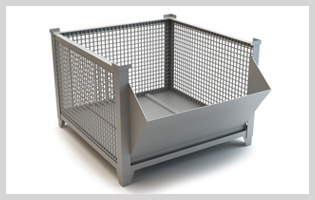 The mesh sides of wire mesh pallet cages are ideally protect the goods. It is used to handle many objects and products with various shapes and sizes. The ideal characteristics of these pallet cages are that they can be stacked and collapsed. It saves logistic cost as well as space in the storage and ware houses. Team of experienced professionals made us capable to construct custom pallet cages as per requirement.